Jackie Baudouin and her fiance, Dave, live in a tiny basement apartment in Washington, D.C., so when they started thinking about adopting a dog, they thought a small, older one would be the best bet. He or she would be house trained and wouldn’t need a lot of room to run around. “When we started searching … on Petfinder, we kept seeing this Boston Terrier Rescue pop up,” Jackie says. 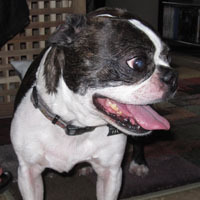 The organization was Boston Terrier Rescue of East Tennessee in Maryville, and one of their listings was for a little old guy named Guinness who had been given up by his family when he was 10 years old. It was no surprise that he was on anti-anxiety medication after such a traumatic separation. The couple was convinced that he was the dog for them. Jackie spoke to his foster mom and submitted personal references. A member of Boston Terrier Rescue (BTR) who lived in the Washington area came to their apartment and interviewed the couple. They passed the home check, so the adoption was on. It took Guinness a little while to adjust to his new home, but now he’s a full-fledged family member and no longer needs his anxiety medicine.